If you know me, you know I’ve been a Smoothie for breakfast devotee for decades. 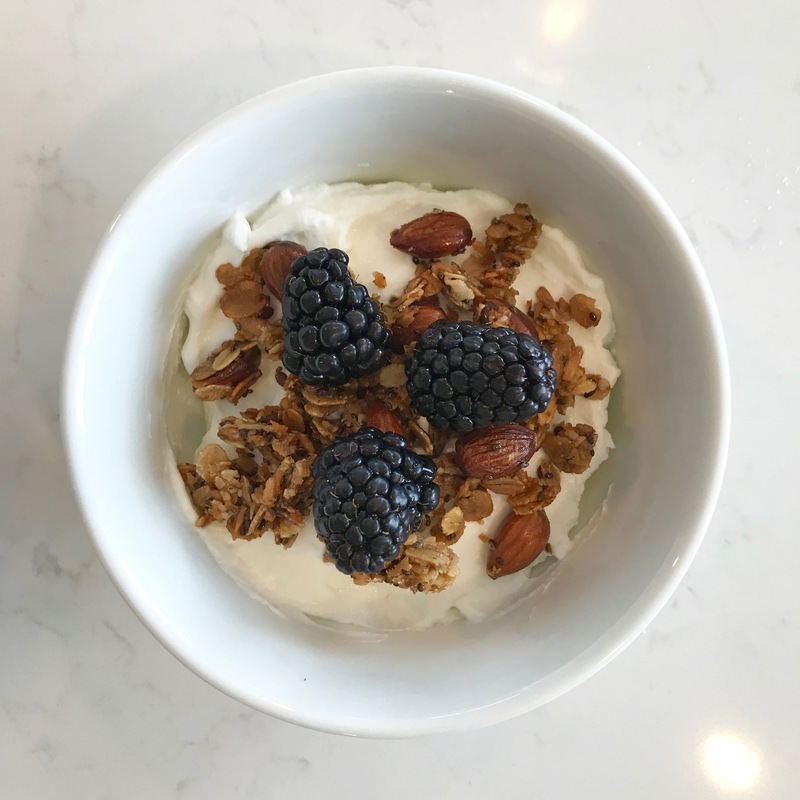 My husband Chris on the other hand loves a varied menu of eggs, toast, cereal, fruit, juice, yogurt and…granola. We go through a lot of it. And since I don’t eat it, I often forget to stock up on it. That’s just what happened the other week. That misstep inspired me to take matters into my own hands. Literally. 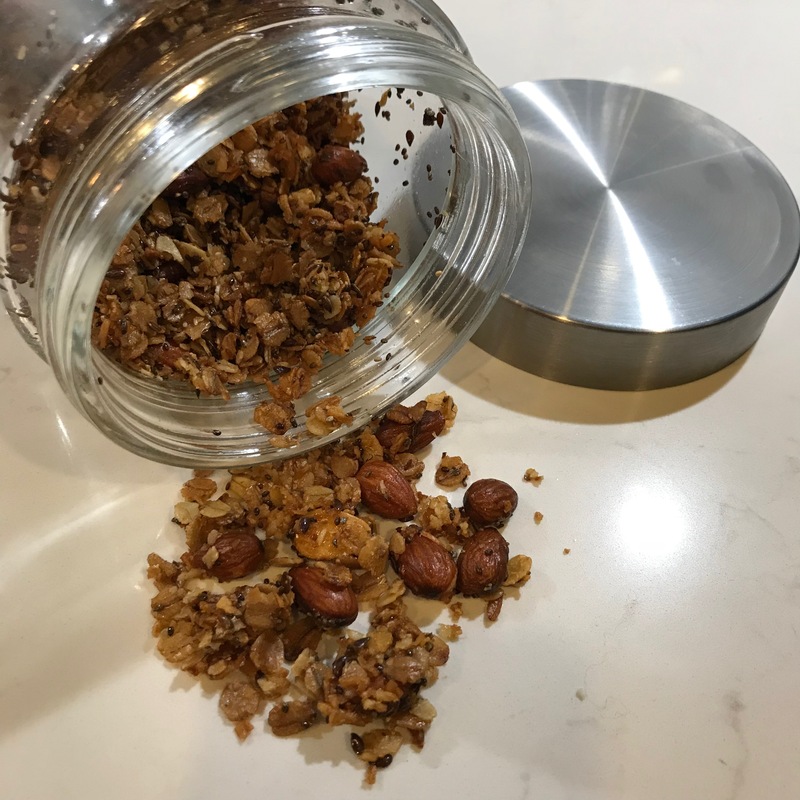 It helped that Cookie and Kate, one of my favorite online cooking sites, was featuring this Orange & Almond Granola recipe. It sounded delicious to me, but I knew Chris would not like the orange flavoring. 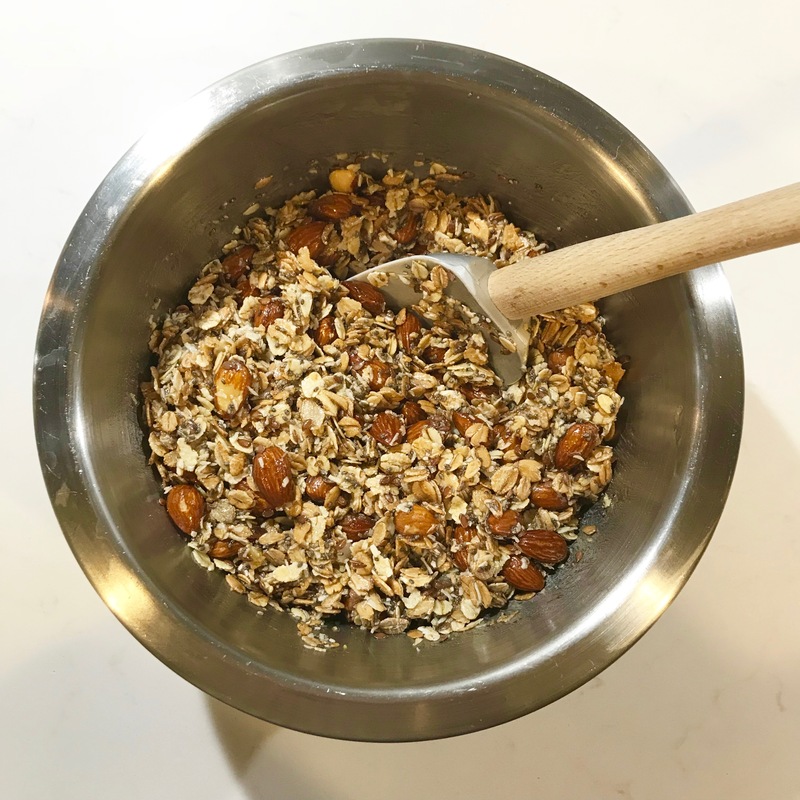 And so my first batch of homemade granola was born! It was easy and fun to mix up. Best of all, it was a hit with the Hubs. 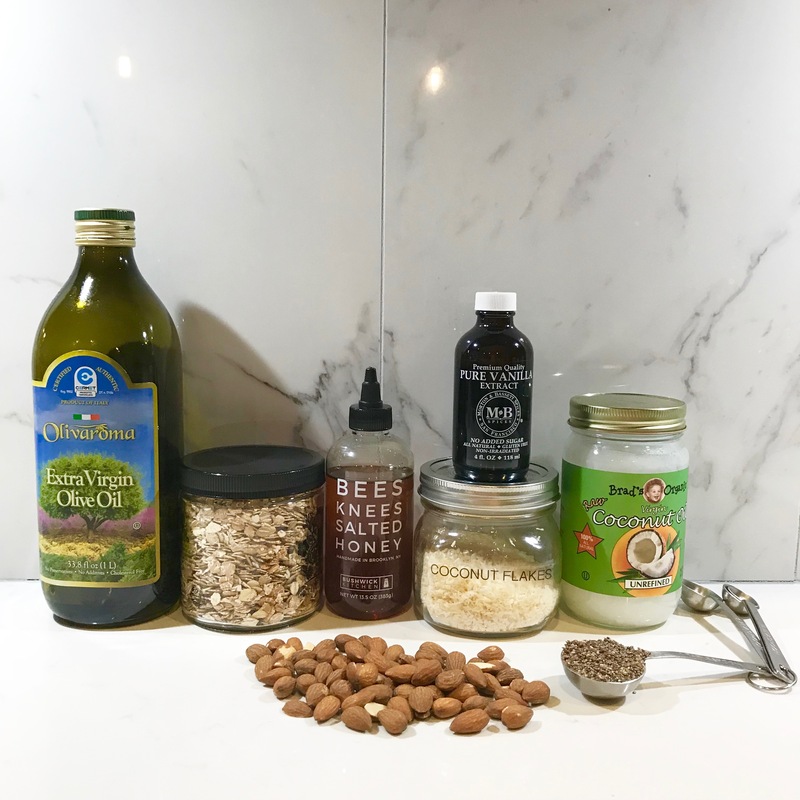 Measure out ingredients and add everything to a medium-sized bowl, going from dry (oats, nuts, etc…) to liquid (honey, oils). Spread out and pat down on prepared baking sheet. Once golden brown, let cool. This is when it will crisp up. Once cooled, crumble into air-tight container. I think this would be an awesome cooking project with grandkids…if I had them. And how cute would this be as your next hostess gift? 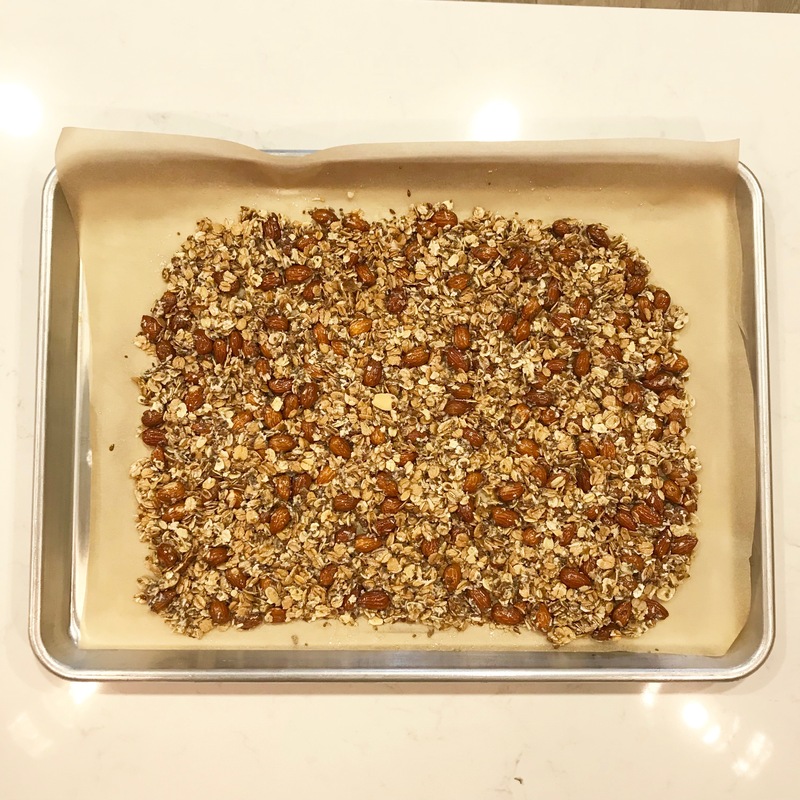 Seriously, this granola is so easy to make (who knew) that I could see trying a different combination every 2 weeks or so. I’ll keep you posted on that. And…if you invite us for a weekend, there could be some granola in your future. Looks amazing, gonna try it! Thanks, Bonnie. And what’s so fun is that you can make up your own combination on the spot. Let me know what you come up with! Awww…c’mon. You can do it! Looks great. The 3/4 cup oil seems a bit much. I will make this gluten free and half the oil and see how it goes. I love the idea of citrus zest. Thanks! I hear you on the oil, Catt! In fact I did cut it down from my inspiration recipe. Let me know how it works out for you! Will do MP and will share what I do come up with! Let me know what you think of avocado oil. We use occasionally already but didn’t think to try it with this recipe. And I do think you could easily go with less oil all around. Just re-checked recipe. Should be 1/4 each of coconut oil and olive oil or 1/2 cup of one! Have updated!! Thanks for keeping me honest!! !